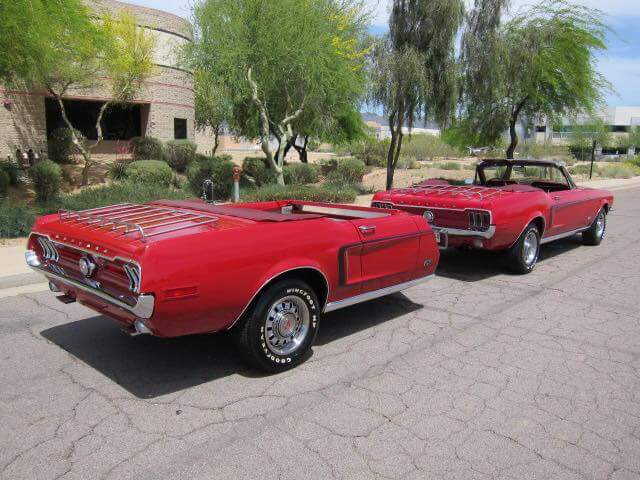 Anyone happen to to what the towing capacity/max tongue weight is for a 73 convertible. Thinking about a lightweight teardrop style camper for an upcoming extended road trip. H code 351, FMX. Wow, that is a risky question! 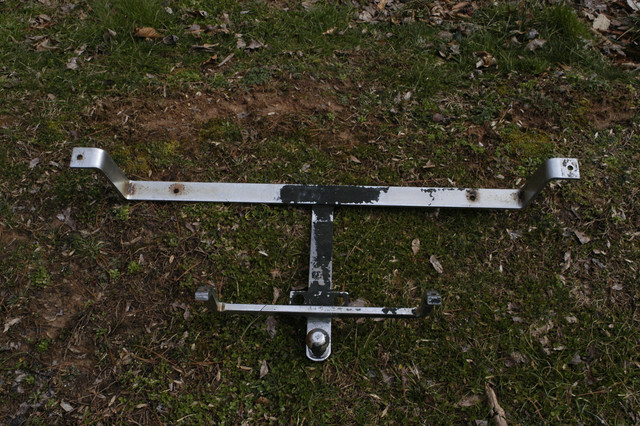 What type of hitch do you have? The only ones I have seen on our cars are the ones that fasten to the rear bumper and the underside of the car. I wouldn't trust that to tow more than a canoe. There’s a member on here who goes by spike morelli. He uses his 72 Mach to pull his jet boat. Ford offered an optional hitch that attached to the rear bumper and IIRC, went under the tank and bolted to the front tank crossmember. It's a reasonably sturdy hitch. There's actually one on eBay right now. 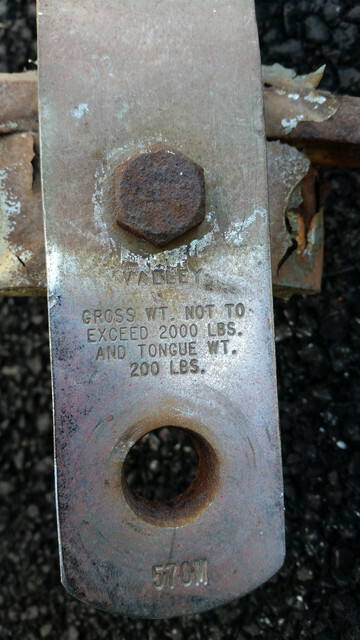 You could increase the strength a bit if you made a crossbar that bolted between the bumper brackets and was sandwiched by the bolts through the bumper itself. I have two Mustangs that had trailer hitches on them. The one on ebay is not like what is on mine. 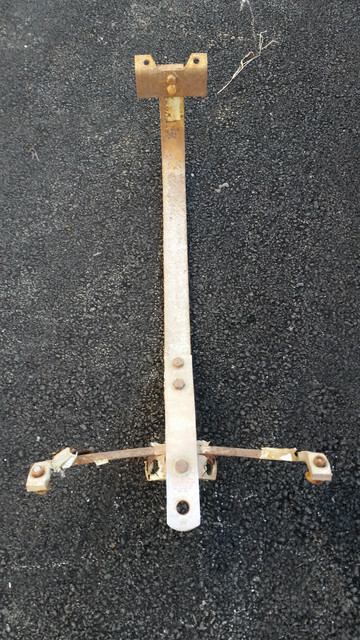 They do bolt to the bumper but also has a cross bar welded to the tow hitch that goes to each side where the shipping tie down brackets use to be. Also had a Maverick with hitch to pull camper. The 72 Mach 1 T-5 that I have use to pull a big ski boat. The crashed 72 vert I have also had a Ford hitch on it. The PO had a boat shop. The towing is not the issue it is the stopping, lol. You have to take that into consideration. If you get a camper make sure it has surge brakes on it. The tongue will have a master cylinder on it and when you apply your brakes the weight of the camper shifts forward and applies the brakes on the camper. This works much better than the electric because it sort of self adjusts. As the stopping forces drop the brakes back off on their own. I have a camper that has that brake system and also a car dolly. You feel no difference when pulling and stopping with the brakes working on the trailer. Most of the rental trailers and dollies have them also. 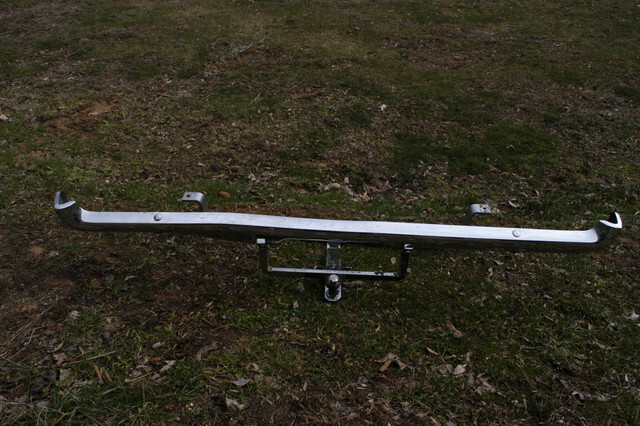 I will get couple pics of the hitch today and post up. 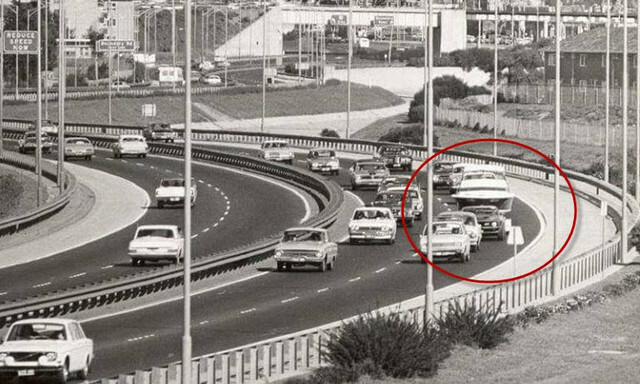 The 71 - 72 should be different due to the 73 bumper being moved back for the crash requirements. 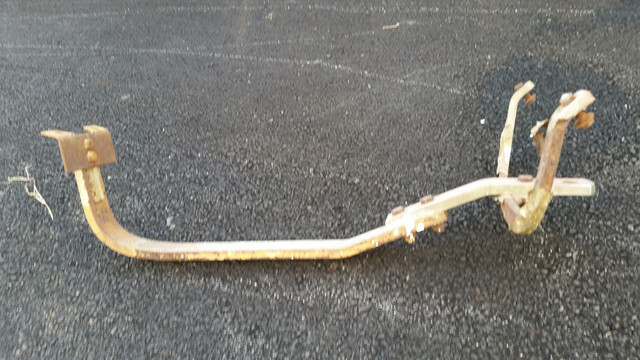 I would also go inside the bumper and add another piece of angle iron to spread out the force farther. I towed trailer with my 85 SVO for years. I worked at a lawn equipment plant and would go to employee sales and buy couple garden tractors and take from Orangeburg, SC to Hendersonville, NC and my mom would sell. Also pulled the trailer to haul racing kart to the track when me and son raced. I use to pull car trailer with a 69 Ford Econoline van with a 240 6 cylinder and also a camper with it. You just have to use common sense and not tailgate and not let the trailer drop off the shoulder of the road. In Africa most of the cars are small and most of them have trailer hitches on them. 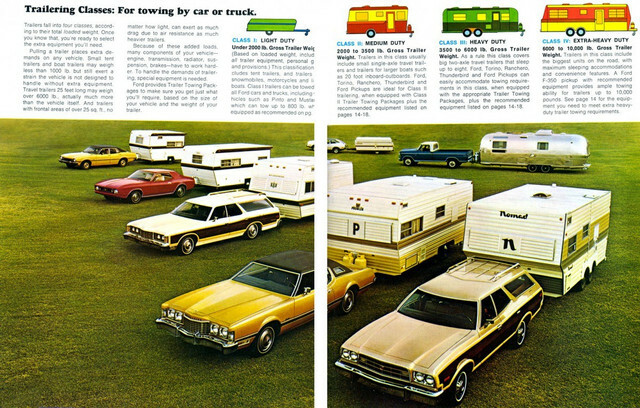 They pull caravans, campers, and also small trailers to put baggage and stuff in. If you have a family no way to haul them and stuff in the car, lol. 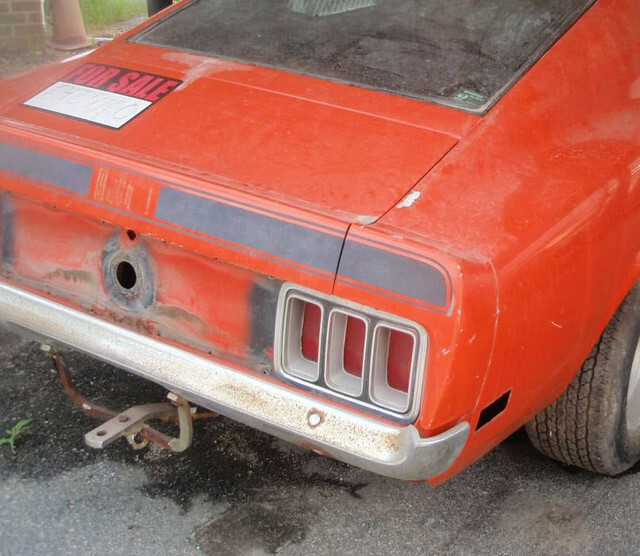 I have the back end of a 72 Mustang vert I was going to make into a trailer for one of mine. I wanted to put hitch on my 73 vert but the PO put an exhaust system on the blocks getting it in there. I got some pictures while down at garage. This is obviously not a Ford part or would have the Ford logo on it. It is built pretty beefy. 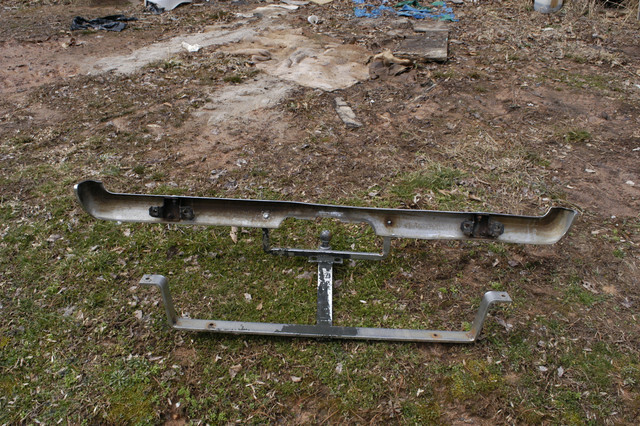 Two 7/16" bolts in bumper and two in the frame rail I think are 3/8" or 7/16". 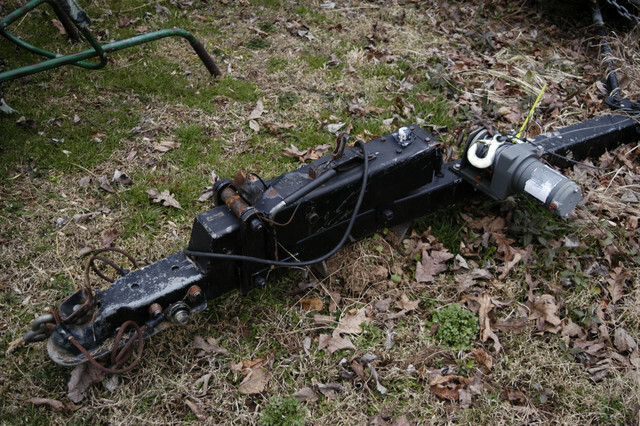 Also a picture of a tow dolly with the brakes on it. 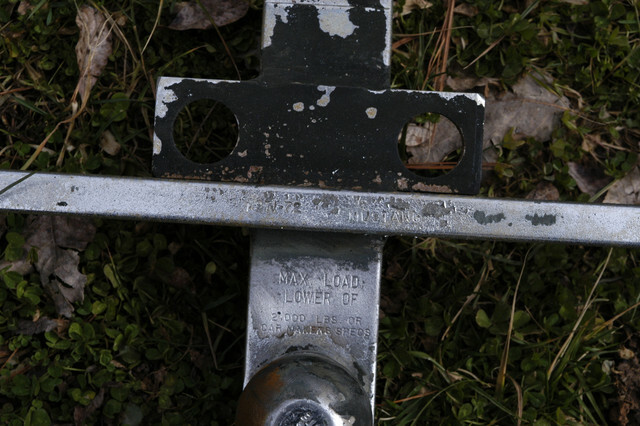 You can see stamped into the hitch 71 - 72 Mustang. It came off a 72 one owner car. Would be easy enough to make one if you can get the heavy metal bent. Best to bend and not weld much stronger. (02-13-2019, 07:15 PM)mbrew2 Wrote: Anyone happen to to what the towing capacity/max tongue weight is for a 73 convertible. Thinking about a lightweight teardrop style camper for an upcoming extended road trip. H code 351, FMX. 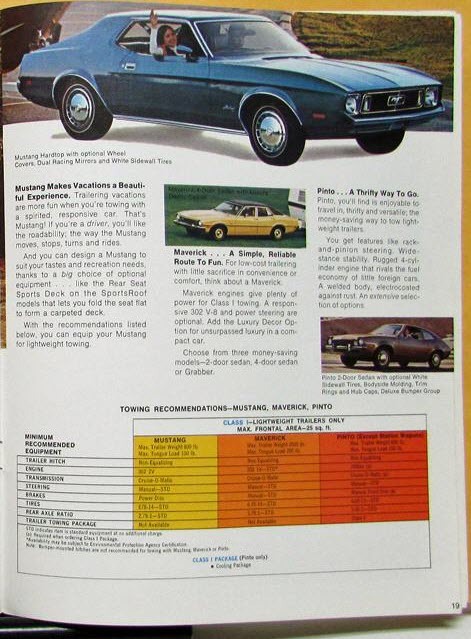 Just for information, looked in my original 73 mustang owners manual and there was a "towing" section that says max towing capacity of 800# with a max tongue weight or 100#. Guess that excludes my idea of a small teardrop-style camper since most I have found are 1100 to 1500# with tongue weights of from 150 to 200#. These Ford ratings were with the factory hitch option.